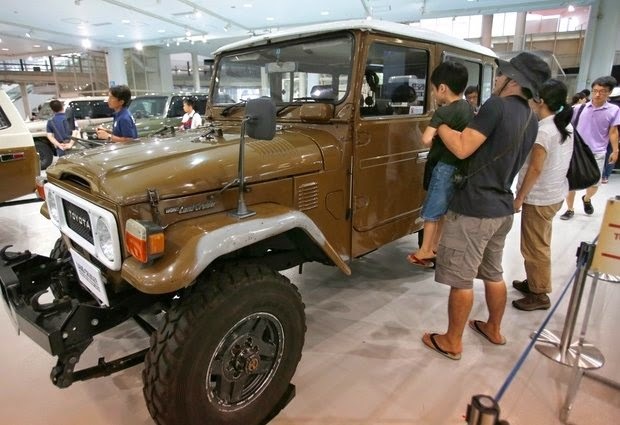 Visitors look at a Land Cruiser BJ44 (1974-1979) during the Land Cruiser Motor Show at a Toyota showroom in Tokyo, Monday, Aug. 25, 2014. TOKYO (AP) — Toyota Motor Corp. is bringing back the Land Cruiser 70 in Japan, catering to nostalgic demand for the rugged off-roader that's favored for challenging terrains and as an aid agency vehicle in disaster zones. The 3.6 million yen ($35,000) Land Cruiser 70, the toughest of the Land Cruiser models, arrives at Japanese dealers Monday. But it's on sale for only a year, with planned production of 200 a month. Japan sales were discontinued in 2004, but fans have long wanted the model back because of its fun-to-drive features. "If you ever have to entrust your life with a car, I'd choose the Land Cruiser," chief engineer Sadayoshi Koyari told reporters at an event for car fans in Tokyo. The 70 model first went on sale in 1984, and it's still sold in the Middle East, Africa, Australia and other places, averaging 6,400 vehicles a month in sales. Its durability is based on its ladder-frame chassis and suspension, according to Toyota, the world's top automaker. It's designed for places where a breakdown is not just a hassle but also possibly fatal. But Japanese fans have long wanted the model back since it was discontinued here in 2004. Masahiro Terada, 67, a Kyoto lumber merchant and fan of the Land Cruiser for decades, heads a network of about 50 Japanese Land Cruiser owners, who gather at unusual spots such as bumpy volcanic areas near Mount Fuji and rivers in southwestern Kyushu, to test the vehicle's off-road features. "A Land Cruiser is a toy for a big boy, those adults who never grow up," he said with a laugh, vowing to drive a Land Cruiser until the day he dies. The U.N. and the Red Cross use the Land Cruiser for relief efforts in disaster zones, making it a model Toyota is proud to claim as part of its brand. The Land Cruiser is Toyota's longest-running nameplate, with a cumulative 7.9 million units produced worldwide. Its long history means there are plentiful parts from models sold around the world, including in emerging economies where easy and reliable maintenance is crucial. The comeback offering, which is also available in a 3.5 million yen ($34,000) pickup version, boasts up-to-date safety and smart-key features, a 4.0 liter V6 engine and five-speed manual transmission.